This picture was taken from our deck the eve of St. Patrick's Day. How appropriate is that? 1. Even though I was a child of the 80s, I never had a Rainbow Bright doll. Probably because I didn't really like dolls. I did, however, have a large assortment of plastic animals. 2. Today starts Spring Break for the boys. I hope we have some good weather for outside activities next week. 3. I'm excited to plant things like tomatoes in the garden in a couple of weeks. I've decided I'm going to try to outsmart those rotten little squash bugs this year by planting all of my squash plants later in the season. Maybe early June. I hope this works! 4. The best part of Spring is the smell of damp earth being warmed by the sun. I think if they could bottle that up people with SAD (seasonal affective disorder) wouldn't need those sun lamps - they could just take a whiff! 5. I am starting to have anxiety over Google Reader getting the axe. I do worry that Blogger will be next. I've been happy with the Blogger platform and even when they had that big 2 day outage a couple of years ago, I was never tempted to switch. Change can be good but sometimes it really just stinks. Linked with Random Friday at A Rural Journal. Love the photo, I can just picture a leprechaun standing beneath the rainbow! Yes I'm hoping for good weather for the kiddos too ! I think they have been inside way to long now !!!! Wow I didn't know any girl in our generation that didn't have a rainbow bright doll lol those were huge !!! Hope you have a wonderful easter !! if i still had my rainbow bright doll i would let you enjoy it in your now adult life. i could send you some stickers. I'm with you and the plastic animals ... or stuffed ones... didn't like dolls much! My Granny never planted anything until Good Friday. I'm not doing veggies this year. I got lazy! I'll hit the farmers market instead. I love digging in the dirt and the smell. Happy Spring! Beautiful picture of the rainbow and how fitting it was. What an amazing picture! I so wish we could get together for Spring Break. I hope you go to Kid's Planet. Until this moment - I never considered blogger disappearing. Oof! Still, "This Or Something Better" - right??? AND - Blogger is so important to so many . . . NAH - morphed and improved - like it has been doing for a long time . . but - well, whatever - it is such a gift, yes? Thanks for reminding me that my children were "children of the 80s". Lol! Neat rainbow picture, Lisa! Hope you have a wonderful Easter weekend! Have fun with your boys. We had lots of Eartle toys and build lots of farms on the living room floor. Mom enjoyed building farms with us. I had Rainbow Bright bed sheets. Happy Easter, Lisa to you all. I have heard wrapping your squash plants with foil at the base where the larvae burrow. Also keep acontant watch for brass colored egg clusters and remove.Rotate them to a different are is good as well as burning the refuse. I'm totally with you on #5 and afraid of what the rogue CEO of google will do next. Hope you have a great time with the kids. Best of luck with your garden! Lovely rainbow! Thanks for sharing it. Our Spring break has officially started too and we are keeping our fingers crossed for warm weather next week!!! Enjoy your Easter my friend! I'm glad I'm not the only one wondering if blogger will be next. I don't like when companies start trimming here and there. Have a blessed Easter weekend with your family! Fabulous! I find that rainbows tend to wash out when faced with my camera lens, it can be hard snapping one. OH NO, I hadn't even thought of Blogger...the news said that Google reader was not used that much anymore, and I think we can't say the same thing about Blogger. Did you find a substitute reader? There are lots of them put there and many of my followers are already using new ones. Let me know if you need one. Lovely photo and a happy Easter and spring break to you. I've been concerned about the changes with Google Reader, too, and how it will affect Blogger. The rainbow shot is stunning. Wonder what is at the end? Hope you and the family enjoy your Spring Break. And Happy Easter! I love that smell too! I'm so ready to start gardening, but it's still too cold at night. Soon, though! Love your rainbow... did you ever check to see if the pot of gold is still at the end of it? I don't want blogger to go away either, oy! Change to feedly. It's very similar in feel to Google Reader so you'll probably like it, and they make it super easy to import your current RSS subscriptions. You are so right about the scent of the earth! :) It's magnificent. Actually, all of Springtime smells wonderful. Maybe part of it is because we have to wait so long for it? Anyway, this is my favorite season. At least until summer comes, then that will be my favorite. lol. Have a good spring break with your boys! No way....it's perfect and it's a double one! They better not get rid of Blogger, that would be tragic!! Enjoy Spring break and Happy Easter. So cool about the rainbow! 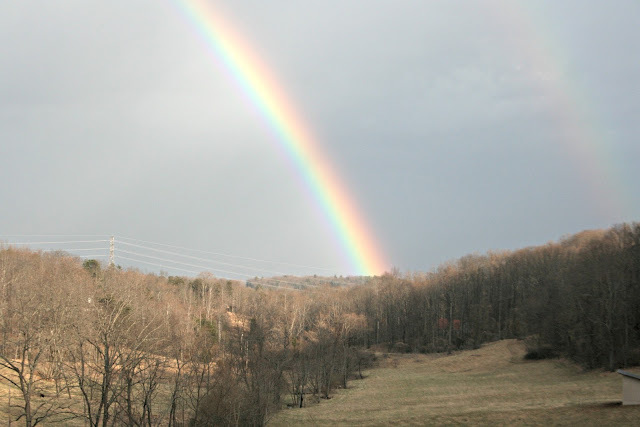 Rainbows, and the smell of damp earth make me happy, too! I'm not happy with Google right now. I was shut down for two days recently, like I didn't exist...now they are trying to make me use their respond on the inbox feature. It took me a while to get used to the Google Circles thing. Great pic you captured. I sure hope blogger won't go away, but I worry, too. I hope you all have a nice Easter and a very enjoyable spring week. That is absolutely beautiful, Lisa! You're making me nervous about google! lol! Enjoy sprng break. Can't wait to see what you do! What a lovely capture of this rainbow. I have been on vacation! What is this about Google Reader?? Beautiful rainbow..... Neat that you saw it on St. Patrick's Day!!!!!! Hope you all have a wonderful week next week for Spring Break. We haven't had any spring much up here yet... SO--until we do, we won't smell that damp earth... Love smelling Spring!!! I've switched to Feedly and like it.. Not sure what Blogger will do --but I'm not ready to change!!! What a headache that would cause if Blogger went away. Blah! Let's hope that doesn't happen! We are on spring break as well this week. Whew! Been a long time comin'. I'm going to let Jen on the Edge school me on what to do for blogger and reader. And keep us posted on how your experiment with the later squash planting goes. No Rainbow Bright?! I even had the carry all playset at my grandmother's. OKay, maybe you're not that deprived, she wasn't really that special. Beautiful picture and I'm with you excited for Spring!!! I am with you I need blogger!!! Nice rainbow photo. Happy Easter. I wasn't a fan of dolls either... only had one or two because they were given as gifts..a raggedy ann, and a dawn doll or two, which is really a mini barbie. Mostly, I had breyer horses and johnny west horses and figurines, stuffed animals and a bike. and OMG, say it ain't so about blogger. ugh. Oh dear, if they got rid of Blogger what would happen to all my posts? They wouldn't dare, would they? I do have my blog printed by Blog2Print every year. That way I'll have a record of it. We love the rainbow so much. I wish I could visit your rainbow and find some magic to bring back home. Oh noooo that would be so sad if blogger went away, lets hope it doesn't. Enjoy your week and Happy Easter! Thanks for stopping by our blog! It was nice to meet you. Great rainbow! I worry that blogger will be next too. I guess time will tell.